The muscle layers of murine gastric fundus have no interstitial cells of Cajal at the level of the myenteric plexus and only possess intramuscular interstitial cells and this tissue does not generate electric slow waves. The absence of intramuscular interstitial cells in W/W V mutants provides a unique opportunity to study the molecular changes that are associated with the loss of these intercalating cells. The gene expression profile of the gastric fundus of wild type and W/W V mice was assayed by murine microarray analysis displaying a total of 8734 elements. Queried genes from the microarray analysis were confirmed by semi-quantitative reverse transcription-polymerase chain reaction. Twenty-one genes were differentially expressed in wild type and W/W V mice. Eleven transcripts had 2.0–2.5 fold higher mRNA expression in W/W V gastric fundus when compared to wild type tissues. Ten transcripts had 2.1–3.9 fold lower expression in W/W V mutants in comparison with wild type animals. None of these genes have ever been implicated in any bowel motility function. These data provides evidence that several important genes have significantly changed in the murine fundus of W/W V mutants that lack intramuscular interstitial cells of Cajal and have reduced enteric motor neurotransmission. Interstitial cells of Cajal (ICC) are gastrointestinal (GI) pacemaker cells and intermediaries in enteric motor neurotransmission in the GI tract [1, 2]. ICC express KIT/c-kit and depend on signalling via the gene product protein, KIT, a receptor tyrosine kinase which is essential for development and maintenance of the ICC phenotype . Mutations in the white-spotting locus (i.e. W/W V ) result in reduced KIT expression. These mutant animals develop few ICC at the level of the myenteric plexus (IC-MY) in the small intestine and the reduced ICC numbers is associated with a loss of slow wave activity. Intramuscular ICC (IC-IM) located in the stomach, lower esophageal and pyloric sphincters are absent in W/W V mutant animals . Reduced numbers of ICC have also been reported in several GI motility disorders, such as chronic intestinal pseudo-obstruction [5, 6], infantile hypertrophic pyloric stenosis [7–9], Hirschsprung's disease [10–12], slow-transit constipation and certain forms of gastroparesis [13, 14]. The association between motility disorders and loss of specific populations of ICC suggests that a more complete understanding of the molecular and cell biology of ICC networks within the gastrointestinal tract may help in understanding the etiology of some GI motor pathologies. The aim of the present study was to characterize genetic sequences that are expressed in ICC of the stomach that may encode important functional elements of the GI pacemaker/motor neurotransmission system. We pursued the hypothesis that such genes might show differential expression in the small intestines of wild type mice and W/W V mice [15, 16]. We previously identified fifteen known and novel genes that were differentially expressed in the small intestines of wild type and W/W V mice, which develop few IC-MY using a differential gene expression method [17, 18]. In the present study we hypothesized that there may also be differential expression of genes in the gastric fundus of W/W V mice, where IC-IM are lost. Our gene microarray analysis successfully identified 21 genes that were differentially expressed in the fundus of W/W V mice. The differential expression of these mice was confirmed by semi-quantitative reverse transcription-polymerase chain reaction (RT-PCR). The use and treatment of experimental animals was approved by the Guideline governing Animal Experiment Committee at the University of Yamanashi School of Medicine and at the University of Nevada School of Medicine. Six adult male WBB6F1-+/+ mice (wild type) and age matched six adult male WBB6F1-W/W V mice, weighing 20 to 30 g, were purchased from Japan SLC Inc (Shizuoka, Japan). They were anesthetized with ether or carbon dioxide inhalation and sacrificed by cervical dislocation. For gene analyses, stomachs were removed from the animal and the mucosa with the attached submucosa rapidly sharp dissected from the tunica muscularis. Tissues were subsequently frozen in liquid nitrogen (-196 °C). Tissues were stored at -80 °C until isolation of RNA was preformed . For gene microarray analysis, poly (A)+ RNA was isolated from each tissue sample by TRIZOL (Life Technologies, Inc., Gaithersburg, MD, USA) and Poly (A)+Isolation Kit from Total RNA (ISOGEN, Nippon Gene, Tokyo, Japan).18 Before starting microarray analysis, differential gene expression of KIT between the gastric fundic tissues of wild type mice and those of W/W V mutant mice were confirmed by semi-quantitative RT-PCR (See the section of Semi-quantitative RT-PCR) (Fig. 1A). Microarrays were hybridized and scanned, and image analysis was performed as described previously [19, 20]. In brief, alterations in gene expression were evaluated by reverse transcription of poly (A)+ RNAs in the presence of Cy3 or Cy5 fluorochromes followed by hybridization to mouse GEM 1 microarray chips (Incyte Genomics, Inc., Porter Drive Palo Alto, CA, USA). To confirm the validity of the assay, the experiments were performed in duplicate. The 8734 cDNAs we used represent 7854 unique genes/UniGene clusters: 3205 are annotated and 4649 are unannotated sequences. We assigned a cut-off value, using a variance analysis, to the microarray slide. Genes whose Cy3- and Cy5-signal intensities were lower than the cut-off values were excluded from further investigation. Balanced differential expression was determined for control wild type mice versus W/W V mutant mice. Values that were < -2.0 or > 2.0 in both two independent experiments were considered significant and the mean values of the relative fluorescence ratio for each gene were calculated. A. Expression of KIT gene using semi-quantitative RT-PCR, in gastric fundic tissues from wild type and W/W V mutant mice maintained under fasted conditions. GAPDH levels were measured as a control. B. Representative image of DNA microarray hybridization. Alterations in gene expression that were represented by the ratio of intensity of fluorescence measured using Cy3 and Cy5 fluorochromes. Expression profiles were evaluated by reverse transcription of poly (A)+ RNAs from gastric fundic muscles from wild type and W/W V mice in the presence of Cy3 or Cy5 fluorescent labeling dyes followed by hybridization to mouse GEM 1 microarrays. The image shown was produced by superimposing the Cy5 fluorescence image (pseudo-coloured green that represents expression level of RNA from the tunica muscularis of W/W V fundus) and the Cy3 fluorescence image (pseudo-coloured red that represents RNA expression from wild type tissues). Arrays were counterstained with DAPI (blue). C. Confirmation of the reliability of the microarray data by semi-quantitative RT-PCR. Representative examples of RT-PCR analysis, in fundic tissues from six wild type and six W/W V mutant mice maintained under starved conditions. Expression of the CPO gene was considerably reduced in the fundus of W/W V mice compared to age matched wild type mice, whereas the MCM7 gene showed an increase in expression in W/W V mice. 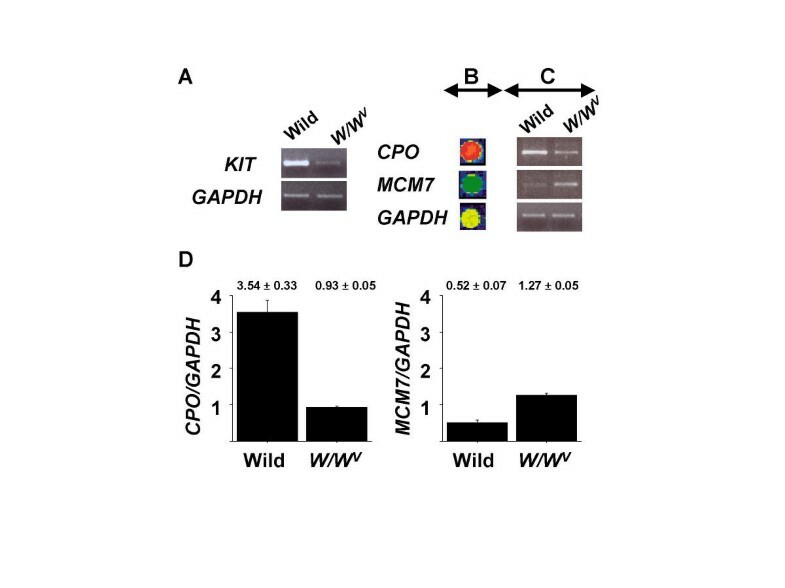 D. Relative expression level of CPO (CPO/GAPDH) and MCM7 (MCM7/GAPDH) in fundic tissues from six wild type and six W/W V mutant mice. The data represent the mean ( ± SD) of six different RT-PCR experiments using six wild type or W/W V fundus RNA as templates. The levels of mRNA expression that were decreased or increased by > 2.0-fold or greater, were confirmed by semi-quantitative RT-PCR from fundus of 6 of each wild type mice and W/W V mice. RT-PCR was performed as described previously . In brief, 2 μg aliquots of total RNAs treated with DNase I (Roche Diagnostics, Basel, Switzerland) from the mice fundic tissues were used to synthesize single-strand cDNAs. These cDNAs were used as templates for PCR in a thermal cycler (PerkinElmer, Shelton, CT, USA), using primers listed in Table 1 or KIT (5'-ATG ACG TCA TGA AGA CTT GCT-3' and 5'-CTA CCC TGG AAT AGG ATG CA-3'), and GAPDH specific primer sets (5'-GACAACAGCCTCAAGATCATCA-3' and 5'-GGTCCACCACTGACACTGTG-3'). Expression of GAPDH served as an internal control. Primers were derived from different exons in the same gene, when the corresponding mouse genomic sequence was available at that time. The PCR reactions were optimized for number of cycles to ensure product intensity within the linear phase of amplification. Primer sets used for semi-quantitative RT-PCR. To identify genes that may be selectively associated with IC-IM, we compared gene expression patterns in gastric fundic tissues derived from wild type and W/W V mice utilizing a gene microarray method [19, 20]. Murine fundus without epithelial tissues derived from wild type and W/W V mice maintained under fasted conditions were used to generate poly (A)+ mRNA for microarray analysis using the mouse GEM 1 microarray. Results of this experiment, highlighting genes that were reproducibly decreased or increased by > 2.0-fold or greater, are shown in Table 2 and Fig. 1B. Several known and novel genes were differentially expressed in the fundus of W/W V mice ( > 2.0 balanced differential expression). To confirm the differential expression profiles, we further examined the expression levels in murine fundic mRNA derived from wild types and W/W V mice maintained under fasted conditions as templates, using semi-quantitative RT-PCR analysis (Representative data were shown in Fig. 1C,1D. All primer sets used for the confirmation were listed in Table 1). Expression of ten genes was considerably reduced in the gastric fundus of W/W V mice compared to age matched wild type mice. Another eleven genes showed an increase in expression in fasted W/W V mice. (a) Balanced differential expression for control wild type mice vs W/W V mutant mice. Values that were decreased or increased by > 2-fold or greater in both two independent experiments were considered significant and the mean values were calculated. All of the results were confirmed with semi-quantitative RT-PCR using fundic tissues from six wild type and six W/W V mutant mice. (b) Subcellular location determined by the SOURCE program http://source.stanford.edu. (c) Human chromosomal localization of the gene. A comparison of differentially expressed genes from the fundus of W/W V mice using DNA microarray analysis revealed that the expression of eleven genes transcripts were significantly up-regulated in W/W V mice, whereas ten genes transcripts were dramatically suppressed in these animals. We confirmed these results with semi-quantitative RT-PCR of tissues from six each of wild type and W/W V mice. Data obtained from these experiments suggest that expression of the genes were specifically regulated in W/W V mice. The eleven genes that were up-regulated in the gastric fundus of W/W V mice were identified as MCM7, p160 ROCK2, BST1/BP3, RBP2, and another seven unannotated transcripts. MCM7 is a mammalian homologue of the yeast nuclear protein MCM2/CDC47, which is thought to play an important role in two crucial steps of the cell cycle, namely, onset of DNA replication and cell division [21, 22]. p160 ROCK2, which is an isozyme of ROCK1 is a target for the small GTPase, Rho . ROCK2 is a serine/threonine kinase that regulates cytokinesis, smooth muscle contraction, the formation of actin stress fibers and focal adhesions, and the activation of the FOS serum response element . The up-regulation of p160 ROCK2 may have a compensating effect for the loss of ICC-dependent mechanisms in the gastric fundus. The BST1/BP3, a bone marrow stromal cell surface antigen, is a variably glycosylated glycosyl-phosphatidylinositol (GPI)-linked molecule that is selectively expressed by early B and T lineage cells and a discrete subpopulation of reticular cells in the peripheral lymphoid organs. It is also expressed on the brush border of intestinal epithelial cells, the luminal surface of renal collecting tubules and mature myeloid cells . This protein is supposed to belong to ADP-ribosyl cyclase family . Cellular RBP2 is an abundant 134-residue protein present in the small intestinal epithelium . It is thought to participate in the uptake and/or intracellular metabolism of vitamin A and belong to a protein family that contains liver fatty acid-binding protein. Vitamin A is a fat-soluble vitamin necessary for growth, reproduction, differentiation of epithelial tissues, and vision. Mammals depend on intestinal absorption of this vitamin for their survival. RBP2, which is confined largely to the small intestinal enterocyte, probably plays an important role in the intestinal absorption and/or metabolism of vitamin A . We also confirmed the down-regulation of ten genes in W/W V mice: BP1/6C3, RHAMM, CPO, and another seven unannotated ESTs. The murine β-lymphocyte differentiation antigen, BP1/6C3 was characterized as glutamyl aminopeptidase, which is reported to serve as cell-differentiation marker of lymphomyelocytic lineages and may be involved in cell activation, signal transduction, and cell-matrix adhesion. It is also expressed by capillary endothelial cells, placenta, and epithelial cells of the intestine and proximal renal tubules . RHAMM encodes a hyaluronan receptor protein . When hyaluronan binds to RHAMM, the phosphorylation of a number of proteins including the focal adhesion kinase pp125-FAK occurs . This is a necessary step for disassembly of focal contacts and subsequent motility. CPO is the sixth enzyme of the heme biosynthetic pathway. This soluble protein is localized in the intermembrane space of mitochondria and catalyzes the conversion of two propionate groups at positions two and four of coproporphyrinogen III to two vinyl groups of protoporphyrinogen IX . It was reported that coproporphyria (CPO deficiency) patients showed constipation and abnormal colic that are main symptoms of this disease . Marked elevation of coproporphyria in the feces differentiated the condition from the Swedish type in which stool porphyrins are usually normal and from variegate porphyria in which both coproporphyrin and protoporphyrinogen fractions are increased in the stool . In the 21 genes identified, we determined the subcellular localization and human chromosomal mapping of the 7 known genes using the SOURCE program http://source.stanford.edu (Table 2). These genes showed a variety of cellular localization including 3 membrane, 2 cytoplasmic, 1 mitochondrial and 1 nuclear proteins. Further analyses of these genes might enable us to elucidate not only their relationship with the KIT, a receptor tyrosine kinase, but also the molecular aspects of GI pacemaker system. We previously identified fifteen genes that were differentially expressed in the small intestines of wild type and W/W V mice which develop few IC-MY using a differential gene expression method [17, 18].™@None of these 15 genes were found in the list of 21 genes that were differentially expressed in the gastric fundus of wild type and W/W V mice which develop few IC-IM using a cDNA microarray. As we confirmed differential gene expression of KIT between the small intestines/gastric fundic tissues of wild type and those of W/W V mutant mice by semi-quantitative RT-PCR, our experimental system could detect genetic aberration in W/W V mice. Therefore our results might reflect the difference of the cellular entity of two types of ICCs, IC-MY and IC-IM, or the difference of the cellular composition between small intestine and fundus. To provide conclusive evidence, which support these speculations, expression profile using purified mRNA from isolated single interstitial cells might be very useful in the next study. At the present time we do not know whether these genes are important to the function of the gastric pacemaker/neurotransmission apparatus or were down- or up-regulated as a result of the loss of ICC. These data, however, provide clear systemic genetic evidence that several important proteins that have roles in cell cycle, cytokinesis and formation of cytoskeleton, cellular metabolism, oxygen metabolism, cell adhesion, and development and differentiation of gut cells are significantly changed in the gastric fundus of W/W V mice. Generation of transgenic animals that show tissue-specific overexpression of the candidate genes, as well as the gene knockout animals might be helpful for elucidating the role of each gene in gastrointestinal motility. The discovery of an entire human and mouse genes through the genome project is supposed to revolutionize biological medicine including molecular diagnosis of various diseases and development of novel treatment. The information combined with high throughput technology such as DNA microarray and SNP typing analysis will accelerate discovery of genes susceptible to or causing various diseases and contribute to screening of novel drugs that target these disease-gene products. In this sense, the effort of the molecular profiling project in which we attempt to discover genetic aberration in animal disease models such as W/W V mice will generate very variable resources for further elucidation of motility disorders. As reduced numbers of ICC have also been reported in several GI motility disorders, such as chronic intestinal pseudo-obstruction [5, 6], slow-transit constipation and certain forms of gastroparesis [13, 14], these gene information should aid the development of novel molecular-targeted therapies for these disorders, and may also identify diagnostic molecular markers for these disorders. We have identified twenty-one genes that encode functional proteins that are significantly up- or down-regulated in the tunica muscularis of the gastric fundus of W/W V mice. Considering that none of these genes has been implicated in any aspect of GI motility, we suggest that many unknown genes could be involved in the cellular changes that lead to motility disorders associated with the loss of ICC. Gene microarray analysis is an effective method for screening the changes that occur in the expression patterns of genes in response to spontaneous or genetic mutations that lead to the loss of a specific cell type. Application of this technique may allow recognition of patterns of gene expression that are common to the several motility disorders in which ICC are lost, thus providing new insights into the molecular mechanisms responsible for the selective loss of ICC populations. Yataro Daigo, Ichiro Takayama contributed equally to this work. Supported by 08457165 (to MF) from the Japanese Ministry of Education, Science, Sports and Culture, JAPAN and DK 57236 (to SW) and PO1 DK41315 (to SW and KS) from the National Institutes of Health, USA. YD and IT carried out the molecular studies and the design of study and coordination. BAJP and CC participated in the molecular studies. SW, KS and MF participated in the design of study and coordination. All authors read and approved the final manuscript.